and the club is going downhill because that isn't the case at all." 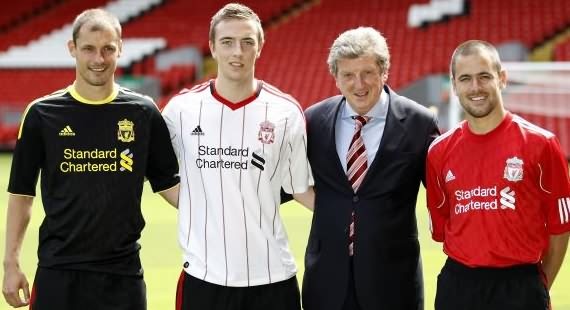 Hodgson with Jovanovic, Wilson and Cole at Anfield. Liverpool have confirmed they have re-signed Fabio Aurelio after the defender put pen to paper on a two-year deal with the club. The Brazilian appeared to have brought his Reds career to an end after leaving Anfield following the expiry of his contract in May. However, Aurelio was offered the chance to earn a new deal with the club by boss Roy Hodgson and, after impressing both the technical staff and medical team at Melwood, has agreed a contract until 2012. Hodgson told Liverpoolfc.tv: "I asked the club to find out whether Fabio had found a new club. "When we ascertained that he hadn't, we invited him back to Melwood so both myself and my staff, and the medical team could properly assess the player. "We were both very impressed and I am delighted we were able to re-sign Fabio." Aurelio was included in the Liverpool travelling party that set off for Sunday's friendly with Borussia Moenchengladbach earlier today. Liverpool's new teenage defender Danny Wilson is looking forward to trying to establish himself in Roy Hodgson's first-team plans. The 18-year-old centre-back signed last week from Rangers for an initial fee of £2million in a deal which could rise to £5million. "Since I have come to the club everyone has been so positive with me," he said. "It is exciting for me to come to a club this size and now I just want to get on with it. "I just want to do the best I can. I have not set myself targets as a player. "If I'm selected for games then great but if not then I'll work a bit harder. Other than that I am just looking to get a good start." Hodgson felt the club had signed a player who was destined for a great future. "In Danny I think we have acquired the services of one of the brightest prospects in Scottish football," said the 62-year-old. Fellow new signing Milan Jovanovic is also looking to take his game to the next level. "This is a big step in my career," said the Serbia international, who moved from Standard Liege on a free transfer. "I cannot explain all my feelings but I am looking to the future and I will try to bring something to Liverpool." Joe Cole believes Liverpool FC will benefit from his best years as a footballer and hopes he can help the club end their long wait for a Barclays Premier League title. The former Chelsea midfielder’s free transfer arrival at Anfield is seen as a significant coup by Liverpool FC manager Roy Hodgson, who only joined the club on July 1 following the departure of Rafa Benitez. Cole was expected to remain in London after both Arsenal and Tottenham Hotspur were linked with him, but despite the prospect of playing in the Europa League - courtesy of a seventh-placed finish last term - and uncertainty over the future owners of Liverpool FC, he opted to move to Merseyside. Having won three league titles with Chelsea, the last coming in May, Cole hopes leaving Stamford Bridge will not bring an end to his medal haul. But he knows that will not be an easy task as Liverpool FC have not won a championship since 1990, coming closest to ending that drought in 2008/09 when they ran were a close second behind Manchester United. "The target of a club like this is the number one place," said Cole. "There was a lot of difference last season but we are starting afresh and we will be doing everything we can. "When you play for Chelsea it (winning the league) was expected every year. "When you come here the whole place is willing it to happen. You can feel that energy and I just want to do my best for the club and if that means we can put some pots on the table then that will be great. "You just look at the history of the place and it is great that I am pulling on the same shirt as people like Kenny Dalglish, John Barnes - great players. "I am 28 now and coming into my peak years and I want to be at a club where I am on the pitch as much as possible and helping the team to really do something special. "I need to feel my confidence again, get myself back to my best, but hopefully I can give my best years to this club. "I wouldn’t have come to the club if I didn’t think we could do things and I just need time and games and we will all do it together." Cole may surprisingly make his debut in Thursday’s Europa League third round qualifying round tie against Rabotnicki in Macedonia. Although Hodgson said he was contemplating whether to throw his World Cup stars back into competitive action against the advice of the club’s medical staff, Cole hinted that he had already made the decision. "I am looking forward to it, I can’t wait for the first game. It is the Europa League game and hopefully I’ll get on the pitch," he added. "I like to get three or four games under my belt before I am firing on all cylinders. "We’ve had a chat but I don’t like talking about tactics because the manager will want to keep that close to his chest, but I’m looking forward to playing. "Everyone knows I would love to play centrally with Stevie Gerrard but the manager will decide - I’ll play anywhere because the club pay my wages and I have respect for my team-mates. "Whenever I pull on the shirt I will always give 100% but I feel I can get the best out of myself playing a central role and if I am given time to bed in I can go beyond the levels I achieved already." Having already referenced the club’s legends, Cole insisted the decision to give him the number 10 shirt initially allocated to fellow new signing Milan Jovanovic, despite being rumoured to be taking the iconic number seven, was not his. "I left it up to the club. I didn’t choose," he said. Javier Mascherano wants to leave Liverpool, the club's manager Roy Hodgson has confirmed. Hodgson has been speaking to the Reds' key figures since taking over from Rafael Benitez at Anfield and while captain Steven Gerrard has indicated he wants to stay, Argentina skipper Mascherano is keen to move on, with reports linking him with a reunion with Benitez at Inter Milan. Hodgson has had more positive news from Spain striker Fernando Torres, who has confirmed his intention to return to the club on Monday and to remain at Anfield. 'Yes, he wants to leave the club,' confirmed Hodgson when asked about Mascherano. 'He has made that perfectly clear. I think he wanted to leave a year go. Recent speculation suggested Torres was keen to play Champions League football this season and was considering his options. Hodgson said that was not the message the club had received from the Spain striker. 'As far as I know he is looking forward to coming back here; he is back on Monday,' said the Englishman. 'He is enjoying a holiday - a well-deserved break as he has not had one for three years. 'He is spending a lot of time with his family, keeping a low profile and as far as I know he is not really speaking to anyone. 'But he has told us that he is looking forward to Monday, looking forward to getting back to work and looking forward to playing for Liverpool next season. Liverpool's Jamie Carragher is confident star players Steven Gerrard and Fernando Torres will "still be involved at the club next season". Torres is yet to return from a post-World Cup break but has been the subject of speculation linking both Chelsea and Manchester City with British record transfer fee bids. And despite Gerrard publicly declaring his desire to remain with his boyhood club for the forthcoming campaign, Real Madrid manager Jose Mourinho is reportedly preparing a £30million offer. But Carragher believes, after the signing of fellow England international Joe Cole and the arrival of new manager Roy Hodgson, Liverpool's star pair will be around to help them recover from their disappointing seventh-placed finish last season. "There's been a lot of negativity and it's been like that for a while," said the centre-back. "I'm sure that Steven Gerrard and Fernando Torres will still be involved at the club next season. "If they are, then the aim for Liverpool must be to get back into the Champions League." The 32-year-old added in ZOO magazine: "Liverpool aren't a club like Real Madrid, who can just throw £100million at it if we don't win the title. "For clubs like Real Madrid and Inter Milan, it's a disaster if they don't win the league, so they go out and spend big money on new players. "Liverpool can't do that - we have to build. Next season, rather than thinking too much about the title, we have to concentrate on getting back into the top four. Sources close to Javier Mascherano are confirming the player hopes to leave Anfield this summer and suggest he has informed the club of that intention. The midfielder met with new Liverpool manager Roy Hodgson earlier today and heard the 62-year-old's vision for the club but seems not to have been won over. The Argentine returned to Melwood from World Cup duty this morning amidst speculation that he will be leaving the Reds. Voicemails and texts left on Mascherano's phone failed to elicit a reply. Though they were not expected to according to Hodgson. Throughout the summer the midfielder has been linked with moves to both Barcelona and Inter Milan. The latter option would see him linking up with former Anfield boss Rafael Benitez who kept the player at Liverpool 12 months ago when he was rumoured to want a move away from Merseyside. Talks about a new deal which was suggested to be signed in a matter of days stalled towards the end of last season. "The talks were extremely amicable. It was all done in a very nice way. Javier made it clear that he wanted to leave a year ago when he and the chance to go to Barcelona," one source is quoted as saying before reiterating that it has been the player's intention to leave for the past year. "He was asked to stay on for one more year, he agreed, so now it is time for him to go. It was all very pleasant and it is now a question of the two clubs who are interested in him making an acceptable offer to Liverpool." Former Liverpool manager Kenny Dalglish says he hopes striker Fernando Torres will commit his future to the club. The 26-year-old has been linked with a move away from Anfield, but Dalglish said he felt the arrival of new boss Roy Hodgson could persuade him to stay. Captain Steven Gerrard has since said he expects to stay at the club, while Joe Cole has signed from Chelsea. "When Torres sees that and talks with Roy I'm sure he'll give us good news," Dalglish told 5 live's Sportsweek. Hodgson told the News of the World on Sunday that he believed he had done all he could to keep Torres at Liverpool. Torres has been struggling with injury of late and is currently out with an adductor problem although the club are hopeful he will be fit for the Premier League opening fixture against Arsenal on 15 August. Chelsea are rumoured to be among the clubs interested in the Spanish World Cup winner, but Dalglish added: "I hope Torres stays. Only Fernando knows what is going to do. Unfortunately for him he is injured but he is a fantastic player and is very happy around the club and the city. "The fact that Stevie is staying will be a great help and players like Joe Cole, Milan Jovanovic, Jonjo Shelvey and Danny Wilson means there is buying for present and the future." Meanwhile, Dalglish said he was unsure about whether he will return to football management. The 59-year-old has been out of management since ending a short spell with Celtic in 2000. He was keen on the Liverpool post after Rafael Benitez's exit, but stepped aside when it became clear he was not in the club hierarchy's thoughts. "Whether I would be a manager somewhere else remains to be seen. I don't know," he said. "Sometimes you miss the buzz of competing at the top level but you don't miss it when you lose a game because it can be very lonely." A Reds player for 10 years and manager between 1985 and 1991, Dalglish returned to the club last year to take up a senior position at the club's academy as well as an ambassadorial role at Anfield. "When Rafa went I offered to help in any way I could," he said. There was a list made up [managing director] Christian Purslow and I spoke to a few people. "After the initial conversations I stepped aside and the board made the decision who would be the next manager. "I said I would help in any way I possibly could for Liverpool and I would have been prepared to be the manager if they wanted that. "But they didn't want that to happen which is their prerogative and that is no problem for me. "I was very happy at the club last year working with the academy and being an ambassador and it was enjoyable." Dalglish believes the future is promising for Liverpool after the team failed to qualify for the Champions League this season. "Signing Joe Cole and Steven Gerrard coming out with a statement saying he is staying gives everyone a lift and it wasn't a bad week for the club," said Dalglish. "Roy is going to stamp his own authority on the club. It is difficult at the moment because the players are coming back in dribs and drabs after the World Cup and you don't have everyone coming back together it is difficult." Liverpool manager Roy Hodgson says he remains in the dark as to whether Fernando Torres will commit his future to the club. Hodgson has been waiting to hear from the Spanish striker, who has been widely tipped to depart Anfield over the summer following their disappointing seventh-placed finish in the Premier League last season and off-the-field turbulence. Torres is resting after helping Spain to their first ever World Cup crown but is in discussions with managing director Christian Purslow in a bid to sort out his future. But Hodgson says he has not received any updates from Purslow and refused to speculate on the outcome of talks, which he hopes will see the 26-year-old remain at the club. When asked if he had any updates on the situation, Hodgson told Sky Sports News: ""No, but Christian might be able to if you got hold of him. I haven't spoken to him for the last two days he's been travelling back from Spain where he's been on holiday. "His holiday has also been taken up a lot of time by discussions with Fernando and his people, so I'm afraid the only person who can give you the type of details you require is Christian. "It would be wrong of me to say too much." Hodgson is hoping Torres follows the lead of captain Steven Gerrard, who publicly pledged his commitment to Liverpool after speculation over his future circulated. Torres was the spearhead of the Reds' attack last season and his departure would land Hodgson a hefty blow as he attempts to reverse the club's decline. Joe Cole's signing has raised hopes of a revival but Hodgson is waiting on Torres to emulate team-mate Gerrard and voice his desire to remain under his stewardship. "That's what I'm hoping for, yeah," added Hodgson, referring to a public statement akin to Gerrard's. "I made it clear from my point of view I'm really looking forward to working with him and I believe he's a key, key figure at the club. "I obviously want him to be a part of the team we're trying to build here and I can only hope he'll buy into what the club is offering him. "I don't think there are any worries with him in terms of me personally or what we're doing. I think the concerns go back once again to the time before I came to the club." Albert Riera has completed his move to Olympiacos on a four-year contract, the Greek club have announced. The Spanish winger was presented to media today after fans lined the streets to welcome his arrival at the Athens club. The 28-year-old fell out of favour at Anfield last season after an outspoken attack on former manager Rafael Benitez and describing the Reds as a "sinking ship". Reports claim the deal is worth £3.3million and that Riera has signed a four-year contract. Riera joined Liverpool from Espanyol two years ago but failed to impress regularly, scoring just five goals in 56 appearances. He was linked with Spartak Moscow last season but his wage demands were thought to have priced him out of a move. Speaking about his motivation for the move, Riera said: "I am eager for titles and honours. "I am comfortable with my decision and I will be playing with a group hunting for trophies. "I came to win titles, which are missing from my career." Riera admits he was taken aback by the reception he received from fans, who turned out in huge numbers to greet him. He added: "I was told the fans were coming but what I saw was much more than I expected. "I did not expect so many people, honestly. It was a surprise for me. "Such enthusiasm is good for the club. I understand how important the support of the people is, it's priceless." Riera joins his younger brother Sito, of Panionios, in playing in the Greek league. TEAMtalk's Simon Wilkes feels Wayne Bridge and Klaas-Jan Huntelaar are very much 'realistic' transfer targets for Liverpool boss Roy Hodgson. Roy Hodgson has admitted he has to be 'realistic' over his transfer targets this summer - but I think the players Liverpool need are well within his grasp. The appointment of the former Fulham boss as Rafael Benitez's successor was greeted with mixed feelings on Merseyside, with some fans believing he wasn't a big enough name for the Reds. But the 62-year-old quickly silenced any doubters by first securing the free-transfer capture of England star Joe Cole, then convincing talismanic skipper Steven Gerrard that his future lies at Anfield - two quite stunning coups. Hodgson has yet to work with the majority of his senior players as they are still in holiday mode after their World Cup exploits. But in the meantime he has been busy trying to strengthen the weaknesses that led to last season's woeful seventh-placed finish in the Premier League - and he has quickly identified them. Tabloid talk suggests he will try to prise Wayne Bridge from Manchester City and Klaas-Jan Huntelaar from AC Milan. If these deals come off, then I may be tempted to agree with Ryan Giggs' assertion that it would be 'dangerous' to rule them out of the title race. With Bridge solving Liverpool's left-back woes and Huntelaar providing a cutting edge that would ease the goals burden on Fernando Torres, those two additions would make a huge difference to an already-strong starting XI. It is widely known that Hodgson has a warchest of around £20million to play with this summer - so with only £2million (the rest of the fee is in future add-ons) of it spent on Rangers defender Danny Wilson, he still has plenty of room for manoeuvre, especially as Javier Mascherano has his heart set on a reunion with Rafa which could cost Inter Milan up to £25million. Armed with that cash, the possibility of Bridge and Huntelaar arriving at Anfield this summer would be a very 'realistic' target - and it would kill two birds with one stone as it would also prove the club's ambition to Torres. Giggs admits it's "difficult to say what they are going to do" this season but I can guarantee it's going to be a less stressful campaign for Reds fans - and a far more enjoyable match-day experience. Benitez would more often than not get the fans' backs up with his 'tinkered' team selections, whereas the beauty of Hodgson is he doesn't put square pegs in round holes. Gerrard will be handed a central midfield role from where he can orchestrate wave after wave of attacks, and Joe Cole will be asked to patrol the left flank from where he found his best form in an England shirt. If not Huntelaar, then Torres will definitely have a strike partner in crime, and if the Reds do kick the season off with Bridge and Glen Johnson at full-back, plus Maxi Rodriguez and Cole on the flanks, then the front two will get plenty of top-class service, something sadly missing last season. "Two years ago they were close to winning the Premiership and you can never write them off," concludes Giggs. With Hodgson at the helm, they might just be worth a punt. The Anfield boot room, where championships were once plotted, now serves as Liverpool's press room and sometimes Rafael Benitez would point to the pictures on the wall. They showed the team that won Liverpool the European Cup in Istanbul and Benitez would gesture towards the photographs and remark that most of these footballers, the ones he inherited from Gerard Houllier, were not very good. "I wonder how we ever won it," he'd say. The squad Benitez left behind is considerably better than the one he inherited from Houllier, but Roy Hodgson knew it needed breaking up and rebuilding. With his half-a-dozen languages and his studied, professorial air, Liverpool's new manager may be the nearest thing to an English Arsene Wenger, but he has begun his first month in office with a deft ruthlessness. A manager's first signing sets the tone. In his first summer, Benitez brought in four Spaniards -- one of whom, Xabi Alonso, was exceptional -- and allowed Michael Owen and Danny Murphy, products of Liverpool's once-flourishing academy, to move on. Persuading Joe Cole to leave London was an invigorating move. He may have been a free agent, but he was a name who did not require a Google search or a subscription to 'Marca' to know who he was and when he talked of Liverpool being the "biggest club in the world" or recalling the European Cup semi-final in 2005 "when the atmosphere made the hair on the back of my neck stand up", he talked the Kop's language. Curiously, 'atmosphere' is a word Hodgson uses a lot. More importantly, Cole secured Steven Gerrard's future. The Liverpool captain had not enjoyed last season and he had seldom enjoyed working with Benitez. At 30, he has one move left and did not give his commitment to Anfield immediately after Hodgson's appointment. Liverpool's shortlist to find a successor to Benitez was sufficiently weak for Kenny Dalglish to suggest himself as the new manager. Gerrard would wait and see, although he did not have to wait too long. If there is a photograph that sums up Liverpool's summer, it is the one of England team-mates Cole and Gerrard grinning as they cycle beside each other at training camp in Switzerland. It was not a surprise that Emiliano Insua and Fabio Aurelio had been the first to join Yossi Benayoun on the road out of Anfield. Just as Wenger seemed unable to bring a high-class goalkeeper to Arsenal, full-backs were Benitez's blind spot. Josemi, his debut signing for Liverpool, was the first in a long and dispiriting line, especially as he lost faith in another academy product, Stephen Warnock, who was to prove better than those who replaced him. Wayne Bridge is not the best left-back in England but he is more consistent than Insua and as good as Fabio Aurelio and, if Manchester City are spending £17m to bring Aleksandar Kolarov from Lazio, he would very quickly become a bit-part player at Eastlands. Meanwhile, the extras in Benitez's productions are being moved off stage. Albert Riera, who called Liverpool "a sinking ship" in March, will join Olympiakos for a fee of around £4m in the next few days. Sotirios Kyrgiakos, a bargain-basement buy from AEK Athens, is likely to follow him to Greece. On the other side, Peter Crouch may be persuaded back to Merseyside or Hodgson could invest £12.5m in Loic Remy, a 23-year-old who scored 14 times in Le Championnat last season and who is rated by his club, Nice, as a striker with the pace and potential of a Thierry Henry or a Nicolas Anelka. Nevertheless, despite Hodgson's assurances that it was perfectly normal for Javier Mascherano not to return his calls, it seems extremely unlikely that the captain of Argentina will be protecting the back four when Liverpool's season begins against Arsenal. His agent, Walter Tamar, has talked of the "magical taste" of a reunion with Benitez at the new European champions, Internazionale. Frankly, it would be hard for anyone at Anfield to deny Gabriel Milito's assertion that: "It is unrealistic of Liverpool to think they can keep hold of him when they can't even offer him Champions League football ." As for Fernando Torres, nobody really knows. Perhaps the biggest factor in Liverpool's favour is that there are few clubs that could raise the fee for him. Perhaps that is why there was a realism about Hodgson as he prepared for his first game, a 0-0 draw against Grasshoppers, last night. "It is not going to be an overnight thing," he said. "I don't want to dupe the Liverpool public by telling them that everything is rosy because Joe Cole has signed. There is a lot more to be done and many more players needed." Liverpool manager Roy Hodgson has revealed the club remain locked in talks with Fernando Torres over the striker's Anfield future. Hodgson has been boosted in recent days by the capture of Joe Cole on a free transfer and captain Steven Gerrard's pledge to remain with the club next season, and is now hoping Torres will throw his support behind the new boss. The Spain striker is yet to report back to the club following his involvement in Spain's victorious World Cup campaign, but Hodgson is optimistic the talks will lead to a positive breakthrough. "Christian Purslow, the club's managing director, has been talking to Fernando Torres for the last two days so there have been lots of words. But I haven't spoken to him," Hodgson said in quotes reported by The Sun. "I was confident Steven Gerrard would stay with Liverpool because he is the heart and soul of the club. It would have been a major blow to lose him. Steven Gerrard has pretty much said he's staying and that's a big boost. "It was a major day with the signing of Joe Cole in tandem with Gerrard saying he is staying. Hopefully he will soon be followed by Fernando Torres." Liverpool legend Kenny Dalglish insisted on the signing of Danny Wilson from Rangers. Reds ambassador Dalglish tracked the Rangers kid throughout last season and urged new boss Roy Hodgson to make Wilson the most expensive teenager in Scottish football history. Wilson told the Scottish Sun: "Everybody's told me Kenny's been in my corner throughout the last few months, that he's wanted me to come to Liverpool. "I can't begin to tell you what that means to me, that someone of the stature of Kenny Dalglish rates me. "If indeed he has played a big part in this dream move then I have to thank him for everything he's done. "For him to think I can play . . . well, that's just something else. "Every player likes to be told that somebody believes you are good. If somebody like Kenny Dalglish thinks you are good that's incredible. "I've not spoken to Kenny yet. I'm sure I will at some point and I can't wait to meet him. He's an absolute Scotland legend and it will be a thrill for me to hear what he's got to say. From what I believe he's still heavily involved at the club." Liverpool's Spanish winger Albert Riera has agreed a four-year deal with Olympiakos, the Greek side's coach Ewald Lienen said, in a deal which would be Greece's most expensive transfer. Greek media reported that the deal will see the 28-year-old be paid £2.1 million-a-year, with Liverpool picking up £4.5million for the transfer. The transaction will be a record for the Greek league. "Riera is a very big player who has shown his value on the teams he has played and for the Spanish national team," Lienen told a press conference. The 28-year-old former Espanyol and Bordeaux winger is expected to sign his contract with Olympiakos either on Thursday or Friday. Riera's departure follows hard on the heels of Emiliano Insua's sale to Fiorentina in a £5 million deal. The Merseyside club have been one of the most active in the transfer market this summer, having also signed England international Joe Cole and Rangers defener Danny Wilson this week. Rangers teenager Danny Wilson has completed his transfer to Liverpool after signing a three-year contract with Roy Hodgson's side. The 18-year-old, who won the SFA and Football Writers' Young Player of the Year awards last season, passed his medical at Anfield on Wednesday afternoon. He said after sealing his switch to the Reds: "It's a great feeling to sign for Liverpool. Wherever you go everyone knows Liverpool FC and I'm just very happy to be here. "This is a massive challenge for me. This is one of the best leagues in the world and I'll be playing for one of the biggest teams in the world. "Coming here from Scotland, people may say I might not be ready for this, but that's a challenge I want to put on myself and that's the reason I came here. "Everyone knows about the history of this football club with 18 league titles. "It wasn't a difficult decision to come here as Liverpool aren't a team who come in for you every day, so I can't wait to get started. "There were other clubs interested in me who are in the Champions League, but once Liverpool came in for me there was only one team I wanted to go to." Wilson made his debut for Walter Smith's side nine months ago and went on to start 24 first-team matches for the Gers last season. Joe Cole is looking forward to the challenge of playing for Liverpool, insisting his move to Merseyside was decided purely on football terms. The 28-year-old agreed personal terms on Monday after being released by Chelsea at the end of last season and then flew to the club's training camp in Switzerland to undergo his physical examination before penning a four-year deal. Contrary to reports, the England international has been allocated the number 10 shirt. Much was made of the wage demands - reportedly £90,000-a-week - the England international was making having become a free agent following his release from Chelsea. And having previously played for West Ham he was expected to remain in London, with Arsenal and Tottenham both interested, but was convinced Anfield was the place to start afresh. Cole said he remembered the atmosphere when he played at the ground for Chelsea in the Champions League semi-final of 2005, which Liverpool won on penalties before going on to lift the trophy in Istanbul, and was looking forward to experiencing that on a more regular basis. "This is a massive club. I tried to take everything out of the equation, take the financial and location side out and just thought in football terms," said the England international. "I thought about the semi-final of the Champions League in 2005 when I ran onto the field and the hairs on the back of my neck stood up. "I was thinking about playing in that atmosphere every week and that swung it for me. "I know I have made the right decision and I am looking forward to the challenge. "I have played in London all my life. I could have stayed at Chelsea because the fans loved me and I won things, but I wanted to challenge myself and when I knew Liverpool were interested it was a no-brainer because they are the biggest club in the country." 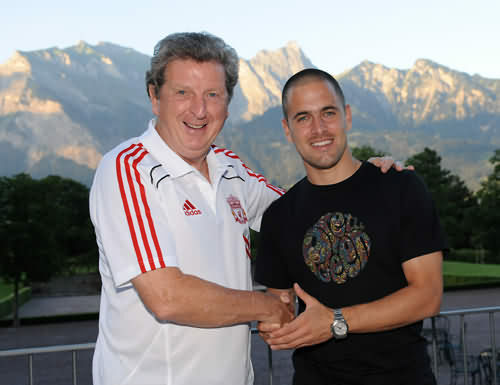 Liverpool manager Roy Hodgson has sounded a note of caution to the club's supporters following the arrival of Joe Cole. Cole formally agreed a four-year deal with the Reds on Wednesday with the transfer - after the player's release from Chelsea - heralded as a coup on Merseyside. Milan Jovanovic has also arrived at Anfield in the summer and a further addition to Hodgson's squad should come in the form of Rangers defender Danny Wilson. Levels of optimism around a side affected by a disappointing Premier League finish last season and off-the-field wrangles have since been raised, but Hodgson urged supporters to be realistic ahead of the new campaign. "It's not going to be an overnight thing," said the former Fulham boss of the prospect of turning the club's fortunes around. "Last season was a very disappointing season for the club in every respect, culminating in a popular manager (Rafa Benitez) leaving. "You don't change doom and gloom or disenchantment with a signing or two. I would never want to dupe the Liverpool public by telling them all is rosy now because Joe Cole has signed. "There's a lot more work to do, a lot more players are needed and we as a football team have got to make certain that when we take to the field the supporters will see there is something different and that we are making the biggest effort we can make. "Then we can only hope they back us like they have always backed the club in the past." Hodgson recognises he is working against a difficult backdrop in the hot-seat but he was eager to unite the club's followers behind him. He went on: "We have to get a good atmosphere back into the club, the Liverpool atmosphere that I've known and seen and experienced - often to my cost - over the years. "We have to get away from the feeling that everything's not right and the club is going downhill because that isn't the case at all." Controversial co-owners Tom Hicks and George Gillett remain in charge at Liverpool despite the club being up for sale and Hodgson is hopeful new investment will be forthcoming soon. But in the preceding period, the 62-year-old wants to focus on football matters with Europa League qualifying and the start of the Premier League looming large. Hodgson added: "We know the situation with the owners; the club is for sale and we are trying desperately for the right people to come in and buy the club. "In the meantime we are trying our level best to do what we can out here on the training field and on the field of play to get results. "I can only hope that the people who watch us are aware of the situation, that they have their feet on the ground like we've got our feet on the ground and they give us credit if we deserve any for the efforts we make on the field." Liverpool have confirmed Joe Cole has passed his medical, completing his four-year switch to the Merseyside club. Cole becomes the Reds' second signing of the summer, arriving on a free transfer following his departure from Chelsea. The England international took part in his first training session with the club at their pre-season camp in Austria on Wednesday morning. Contrary to reports, Cole has been handed the famous No. 10 jersey previously warn with great distinction by the likes of John Barnes and Terry McDermott. The last player to wear the number was Andriy Voronin. A statement on the official Liverpool website reads: "Liverpool Football Club are delighted to announce that Joe Cole has put pen to paper on a four-year deal. "The England international has passed his medical and has been allocated the squad No. 10." Phillip Degen has been told his Anfield career is over. The Liverpool defender, who has underwhelmed during the two years he has been at the club, does not figure in Roy Hodgson’s plans for the new campaign. A handful of clubs on the continent have already expressed an interest in Degen – who made just 12 first team appearances – and Hodgson believes it would best for all if he finds pastures new. “Philipp didn’t get a look in last year and will find it hard to get a look in this year,” said Hodgson. “If he wants to play regularly, he needs to find a club that will say you are our number one man. “He’s not going to be the number one man here with us, so does he want another long season playing on the bench not getting any games? 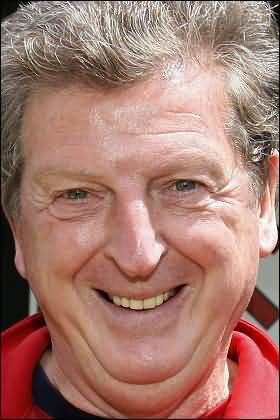 With Emiliano Insua, Yossi Benayoun and Fabio Aurelio all gone, Degen on his way and Albert Riera soon to follow, Hodgson’s overhaul of Liverpool’s squad is well under way. “Degen has been involved here because he is one of the few senior players over here,” Hodgson, whose side face FC Grasshopper tonight, continued. Roy Hodgson believes Joe Cole and Steven Gerrard have helped put the smile back on the faces of Liverpool supporters – but admits any gloom will only truly lift once the club’s American owners depart. On another busy day for the Anfield outfit, skipper Gerrard ended speculation over his future by reaffirming his commitment to the club while Cole underwent a medical in Switzerland before completing his free transfer following his release from Chelsea. The 28-year-old has agreed a four-year deal to become Hodgson’s first signing since taking over from Rafael Benitez earlier this month. News of Cole’s arrival and Gerrard’s decision to stay have been greeted enthusiastically by fans who were fearful of the coming season after months of uncertainty and the ongoing financial concerns. But Hodgson accepts only the departure of co-owners George Gillett and Tom Hicks, who have appointed chairman Martin Broughton to sell the club, will dispel the scepticism of the Anfield faithful. “What will lift the supporters is if we get new investment,” said the Liverpool manager. “I know supporters are very anxious for that. We can’t ever deny it. “All the time we are in our current situation in terms of investment, the supporters are going to be sceptical. You can talk until you are blue in the face but it won’t make any difference. “The owners are not popular with the fans; the fans want new owners, they want new investment. The gloom, if there is any, is never really going to lift until that day comes. Hodgson, who will take charge of his first game for Liverpool tonight in the friendly against Grasshoppers in the Swiss town of Zug, is acutely aware of the financial constraints currently imposed by the board as Gillett and Hicks look to address the club’s spiralling debt. But the Liverpool manager believes supporters acknowledge the predicament and promised to redouble efforts to improve on last season’s hugely disappointing showing. “We may have to work for a little bit longer in this situation but I am hoping that the quality of the performances we are going to give with the team we put out will cheer our supporters,” added Hodgson. “We want to show them our club is very much alive and kicking and who knows? In the future with new investment and a chance to really compete on that front, we’ll be back in our traditional place. “In the meantime, I can only hope that our supporters have got their feet on the ground and the heads around the situation, as I and the players have. “We can’t turn back the clock and we can’t magic up a different situation. We work and live in the situation we are in. We will work very hard in that situation. “Now let’s hope things will change even more for the better in the future. In the meantime, we will use what resources we have got and do the best job we can. 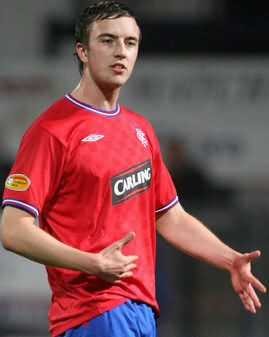 Rangers have agreed to sell defender Danny Wilson (pictured) to Liverpool in a deal worth up to £5million. Liverpool captain Steven Gerrard has given the strongest indication yet that he will remain at Anfield as he welcomed the signing of Joe Cole. There has been speculation over the Reds midfielder's future this summer but after meeting new boss Roy Hodgson, Gerrard now appears set to stay. "I wanted the chance to meet Roy Hodgson privately," the 30-year-old told the club website. "Having done so I'm very impressed with his plans for the future of the team." He added: "I only returned to training on Monday at Melwood with some of the other World Cup players but I can't wait for the new season to start." Gerrard has been linked with a move to Jose Mourinho's Real Madrid during a summer in which he endured a disappointing World Cup campaign with England in South Africa. The fact he has broken his silence about his future will go some way to reassuring Liverpool fans of his future plans, and he explained: "I made it clear that I simply needed to concentrate on the World Cup and then have a decent holiday with my family." New Liverpool boss Hodgson greeted Gerrard's apparent pledge with understandable delight, saying: "It's a great piece of news. There won't be anyone in Liverpool today who isn't delighted to hear that. "I'm really pleased about it because I've got great respect for Steven Gerrard. He's a player who I was really looking forward to working with when I came to Liverpool. "It will be a tough season, with a lot of matches and the disappointment of last season is going to take a while to dissipate, but it is very good that our best player is still going to be playing at this club. "Hopefully with the signing of Joe Cole - and if we are lucky one or two others, to boost the squad - we will be going into this season's competition, maybe stronger on paper than we were last season." Gerrard, along with Jamie Carragher and Glen Johnson, returned to training on Monday as they started their pre-season preparations after three weeks off following England's exit from the World Cup. Liverpool captain Steven Gerrard played an integral role in persuading Joe Cole to sign for the Reds, according to manager Roy Hodgson. That intervention is significant as it provides the biggest hint yet that the 30-year-old is looking to continue his career with his boyhood club despite speculation about his future. Gerrard and Reds vice-captain Jamie Carragher made the most of the time they had with Cole during England’s disappointing World Cup campaign in South Africa to convince their international team-mate that Anfield was the right place for him. Cole was a free agent having been released by Chelsea and Arsenal and Tottenham, who could both offer Champions League football this season, were also reported to be interested in signing the 28-year-old. However, Hodgson said Gerrard and Carragher had done a good job in talking up Liverpool. “Jamie Carragher and Steven Gerrard did a good job in selling the club to Joe at the recent World Cup,” said the Liverpool manager. Cole agreed personal terms on a four-year contract yesterday before flying to Liverpool’s training camp in Switzerland to undergo a medical and meet his new boss. “I am pleased to get the player because it is very important to try to improve our squad as much as we can in order to reach the high goals we have set ourselves,” Hodgson told talkSPORT. Liverpool defender Jamie Carragher has warned their Barclays Premier League rivals they still mean business – and the signing of Joe Cole proves as much. Cole agreed terms on a four-year contract yesterday and flew to the club’s Switzerland training camp yesterday to have a medical. After a disappointing seventh-placed finish last season, and with no Champions League football to look forward to in the coming months, there was a concern Liverpool would struggle to attract top-quality signings. However, Carragher believes the arrival of his England team-mate Cole, who was a free agent after being released by Chelsea, shows those fears are unfounded. “It’s great news and it is a message that Liverpool mean business,” said the 32-year-old, who returns to Melwood today with fellow England internationals Steven Gerrard and Glen Johnson to begin pre-season training today after a three-week rest. “We have signed a top international player who has been really important for Chelsea. A lot of clubs wanted to sign him but it is a real coup that he has chosen to come here and you have got to give the manager and the board a pat on the back for convincing him to come here. “Every supporter that I have spoken to is absolutely delighted and all the players are the same – it’s given everyone a boost, just at the right time. “It has been a long summer and we have been in a transitional period but now the World Cup is out of the way, we can start to look forward again. As far as I can see, Joe Cole has come to Anfield for all the right reasons. He’s fully over the knee injury that has blighted him in recent seasons and has a point to prove. He just wants to play football now and being Roy Hodgson’s first major signing since he took charge of Liverpool, he’s going to play him. It’s a good bit of business for the club with funds tight as if the England international was under contract he’d have probably commanded a fee of well over £10million in the transfer market. I can’t believe that Cole’s other suitors Arsenal or Tottenham weren’t able to offer him the kind of wages he’ll be getting at Anfield – it’s not like he’ll be on ‘megabucks’ in comparative terms, so after having to deal with all the off-the-field politics at Stamford Bridge, I’m sure he’s come purely for footballing reasons. Having spent his entire career to date in London, it will have obviously been a big decision for Cole to uproot his family from the capital but having played at Anfield for both West Ham and Chelsea many times over the years he’ll know that Liverpool have got a great set of supporters who’ll love him and he’s what I’d call a ‘proper player’. He’s also a ‘European-kind of player’ too in that he can understand how to operate in a number of attacking midfield roles whether it be on the left or right wing, off the front man or alongside Steven Gerrard – presuming he’s still at Liverpool next season. This will prove useful, especially given that Liverpool have also acquired the left-sided Serbian Milan Jovanovic this summer in a deal which was set up before Hodgson’s arrival. It seems rather uncertain whether Javier Mascherano will be joining Liverpool’s two ‘Bosman’ signings in the side next season and if he does want to go – which given all the noises coming out of the people around him – it looks like he wants to do so then he should just front up the issue himself and tell the manager. Hodgson has revealed that he’d sent a text message to the Argentinian skipper looking forward to meeting up with him at Melwood but admitted he didn’t expect to get a reply. If a deal could be struck soon for Mascherano then it would at least give the manager six weeks to do a bit of wheeling and dealing to add some more new faces to his squad. Mascherano is very good at what he does but he’s not a goal scorer and he won’t pass players in so if I was offered big money for that type of player I’d always sell. Whatever funds Hodgson gets a fair chunk of them will have to go on a new left-back with Emiliano Insua now following Fabio Aurelio out of the exit door. I can’t imagine Hodgson moving Glen Johnson across to the left as a long-term solution and given his extensive range of contacts across Europe I’m sure he’s got a specialist left-back lined up or else he wouldn’t have sanctioned Insua’s departure. In the end, it was the football that swung it for Joe Cole. Tottenham Hotspur and Arsenal were both waving tempting offers in his direction, but neither club could promise quite the security that Roy Hodgson was all but guaranteeing at Liverpool. Not financial security, for he could have earned similar amounts to the £90,000-a-week deal his agents have negotiated with Liverpool at either London club. But Cole wants footballing security, the comfort that comes from knowing the manager likes you and wants to put you in the team, the kind of security that Cole once enjoyed at West Ham seven years ago but he never really felt at Chelsea. During his seven seasons at Stamford Bridge he yo-yoed in and out of the team under successive managers from Claudio Ranieri to Carlo Ancelotti, failing to convince any of them he should be an automatic selection. Cole started his Chelsea career as understudy to Juan Sebastian Veron, and ended it as a stand-in for Florent Malouda. Along the way he filled his trophy cabinet with three Premier League titles, three FA Cup winner's medals and two for the Carling Cup, and his bank balance, but he was left frustrated because while his England mates John Terry, Frank Lampard and Ashley Cole were all key figures, he was peripheral, a useful man to have on the bench. Ancelotti claimed at the weekend that Cole's departure was "economical", but there were also some serious footballing considerations behind the decision to let the 28-year-old walk away. Cole wanted to play every game, and his frustration at not doing so was felt throughout the squad. His replacement Yossi Benayoun, signed for £5.5m from Liverpool a month ago, will not rock the boat if he is left out. At Liverpool, Cole will find in Hodgson a manager who does not tend to chop and change the side from week to week, a manager who likes his teams to play a passing game, a manager who values English talent, a manager who is universally respected by the players under his charge. Cole will also find a club where creative players are idolised by their passionate fans, a bit like West Ham with knobs on. This is what Cole craves. As former Liverpool captain Jamie Redknapp said yesterday: "He needs to go somewhere, be loved, and play football and get back to being the Joe Cole we all know and love." Cole's early career was similar to that of Wayne Rooney. There was a lot of talk about them before they broke into their respective first teams at West Ham and Everton, when Cole was 17 and Rooney 16. They stayed put for a couple of years before moving on to bigger things, and that's where their stories diverge. Rooney blossomed at Manchester United into the finest English player of his generation, while Cole struggled even to find his best position at Chelsea. Loved by the fans but not by the managers, in his seven seasons at Stamford Bridge he took on a variety of jobs, but sadly his most regular position was on the bench. Last season, Ancelotti tried him in several different positions, from playing 'in the hole' behind the strikers to a place out wide on the right, but Cole never looked convincing, despite moments of inspiration such as a back-heeled goal in Chelsea's decisive 2-1 victory at Old Trafford last season. That will be the biggest change for the midfielder at Liverpool, that he will have a settled role in a settled team. The most important thing for Cole is that he gets to play. The fact that it will be in the famous No 7 shirt, as worn by legends such as Kevin Keegan and Kenny Dalglish, is a bonus. Who wouldn't be swayed by such a prospect? It's almost as good as the No 10 shirt with Brazil. And there is little doubt they will love him on the Kop. No manager has ever criticised Cole's work rate and commitment, characteristics that have earned him the adoration of the supporters at both Upton Park and Stamford Bridge. If he can also win the love of his manager, then Cole will be in his element. As Liverpool's most famous sons once sang: "All you need is love." The drawback for Cole is that by moving north to Liverpool he is undoubtedly taking a step down, from the champions to the team that finished seventh. Chelsea are aiming to win the Champions League this season; Liverpool are hoping to qualify for it next season. Kevin Keegan, Kenny Dalglish and Peter Beardsley or Harry Kewell and Robbie Keane. Who will Joe Cole follow? It is understood that Liverpool's most recent signing will be handed the club's famous No.7 shirt if he passes a medical in the next couple of days to rubberstamp his four-year deal. Wearing a jersey bearing such distinction is an honour based upon ability, but it also comes with a pressure and weight of expectation to meet a set of standards both on and off the pitch. Keegan and Dalglish made Liverpool's No.7 famous, while Beardsley followed in the mould. But others, Kewell and Keane, failed through a combination of factors. How will former Chelsea star Cole cope? Here skysports.com looks at the positive arguments of the England playmaker's arrival on Merseyside. Cole will provide Liverpool with an obvious solution to the left-hand side of their midfield, which emerged as a problem position during the last season. Maxi Rodriguez, Yossi Benayoun, Albert Riera and Ryan Babel all filled the role, but failed to make it their own. Maxi was adapting to life in the Premier League, Benayoun has joined Chelsea, Riera still seems to be on his way out of the club after a fallout with former manager Rafa Benitez, and Babel prefers to play in attack. Cole will settle immediately on the left, with vast experience for club and country, and his arrival will help the sale of Riera, while Maxi and Babel can play in preferred positions elsewhere on the pitch. Cole can also operate centrally or on the right and could offer a different option behind Fernando Torres to give flexibility to Steven Gerrard. There is an obvious reason why the likes of Tottenham, Arsenal, Manchester United, AC Milan and Valencia showed interest in multi-talented free agent Cole, 28, but did not attempt to force a deal - money. Reports suggest that Cole's agreement with Liverpool is worth in the region of £90,000 a week and a significant signing on fee, which other clubs were not prepared to meet. Unquestionably, that is a lot of money for a player who has struggled with injuries and could not force a regular place in Chelsea's 2009/10 first team. However, taking into account the spare cash from the undisclosed sale of Benayoun, worth an estimated £5.5million, and the loss of the 30-year-old Israeli's wages, it looks a shrewd swap that sees Liverpool gain a younger, more talented player. With Uefa rules on homegrown players in mind, Cole's signing helps to meet quotas at Anfield. But it also sends an important message to fans. Merseysiders became disillusioned by the barrage of foreigners who arrived without impact under Benitez. However, Cole represents a player who has a point to prove after the disappointing end at Chelsea and the failure of the 2010 World Cup; a player who is accustomed to the rough and tumble of the Premier League; and one who will be entirely committed to the challenge of restoring faith. It is easy to imagine Cole banging his chest in front of The Kop next season in a 'You'll Never Walk Alone' gesture that will be essential after the difficulties of the last campaign. From a commercial point of view, Cole is also a player who excites. Liverpool followers will be clamouring to buy new shirts with name and number prints, which generates profits and makes Anfield more attractive to prospective new owners. Speculation has not stopped about Liverpool captain Gerrard this summer and manager Roy Hodgson has confessed that he is having to work hard to convince 'disenchanted' stars that they have a future at Anfield. Gerrard, though, will certainly view England squad-mate Cole as a superb signing after watching the playmaker in close quarters for several years for club and country. It will also be hoped that Chelsea-target Torres considers the deal as a step in the right direction. Vice-captain Jamie Carragher should be suitably impressed, having played in a defence that has conceded four goals to his new club colleague over the years. Liverpool now seem well covered in midfield. Milan Jovanovic has arrived and Joe Cole is definitely a man to open defences and bring that bit of craft that was missing last season. Hodgson's next task is to identify a left-back following the departures of injury-prone Fabio Aurelio and the hapless Emiliano Insua. Paul Konchesky, who Hodgson knows from Fulham, and Wigan's Maynor Figueroa have emerged as the rumoured, prime targets and it remains to be seen who will be the next arrival. Liverpool have signed Joe Cole on a four-year deal - subject to a medical - following his release by Chelsea. The 28-year-old England midfielder left Stamford Bridge in June after failing to agree a new contract with the Premier League champions. He was linked to Arsenal and Tottenham but has opted for Liverpool, who failed to qualify for the Champions League. Cole's arrival follows winger Yossi Benayoun's move from Anfield to Chelsea for an undisclosed fee in July. The West Ham academy graduate becomes Liverpool's second summer signing after Serbia forward Milan Jovanovic arrived on a three-year contract from Standard Liege. Cole joined Chelsea from West Ham for £6.6m in 2003 and scored 40 goals in 282 appearances, winning three Premier League titles and two FA Cups. In June he claimed unspecified "political rather than footballing reasons" had led to his departure, but he insisted manager Carlo Ancelotti was not the cause of those problems. "It is not financial and it is nothing to do with Carlo," Cole said at the time. "I love Carlo. I think he is a top guy and a top manager. "I loved my time at Chelsea, I love the fans but it is a story for another day and I will tell it but now is not the time." After recovering from 10 months out with a ruptured cruciate ligament, Cole grew frustrated at having to settle for a bit-part role in his final season at the club. He was used mainly as a substitute and, when he did play, Ancelotti often deployed him in a wide position. Cole, capped 56 times by his country, featured in two of England's matches at the 2010 World Cup, though on both occasions he was introduced as a second-half substitute. "Next season I want to have a fantastic season for England and whatever club I am at. The next contract will be a footballing decision," he added earlier in June. "I want to play in a more central position and I want a manager who has faith in me." Tottenham boss Harry Redknapp, who nurtured Cole's early career at West Ham, had talked of his desire to take the midfielder to White Hart Lane. Spurs finished fourth in the Premier League last season to earn a Champions League qualifying spot while Arsenal, also admirers of Cole, would have offered guaranteed Champions League football. But he opted for Liverpool and new Reds manager Roy Hodgson will hope to bolster his squad further with a new left-back following the departures of Fabio Aurelio and Emiliano Insua. Hodgson is also hoping to retain the services of captain Steven Gerrard and star striker Fernando Torres, both of whom have been linked with moves away from Anfield. And former Liverpool defender Alan Kennedy believes Cole's arrival could go some way to persuading the duo to stay. "I'm delighted for the club," Kennedy told BBC Sport. "Roy Hodgson has persuaded one of the best English players in the game to come in and that will only be good news for the club and for the players the club are looking to hold on to. "I'm sure Roy and Liverpool can get the best out of Joe again, and hopefully it will result in the club pushing back up the league and targeting silverware again. "I've been an admirer of Joe's for the last few years. He is a player that excites fans and he is a player that we desperately needed. "We know Joe had a lot of options, especially from London, but he's looked at Liverpool and maybe thought to himself that he is the guy who can resurrect the club after what was a terrible season last year. "Credit for that has to go to Roy Hodgson, I believe - he is a very persuasive man and a man well respected in football, so that's fantastic news." Another former Red, Ian Rush, believes the signing underlines Liverpool's ability to still compete for the best players in the world despite not being able to offer Champions League football. "Liverpool might not have been successful as we would have liked to have been recently but this shows we can still attract top name players, whether that's an England international or a foreign international," said the Welshman. "This is the signing supporters wanted and it's a big boost for them. "I think this sends a sign out to Liverpool supporters that the club do mean business." Jonjo Shelvey has set a target of making at least 20 appearances for Liverpool next season - although joining the Reds still has not sunk in. Shelvey, who completed his move to Anfield from Charlton at the end of last season, has been training with his new team-mates in Switzerland and the 18-year-old is confident he can make a swift impact for the Merseysiders. "Being at Liverpool is what every kid dreams of," Shelvey told the club's official website. "When I was in school and in the playground I used to pretend to be players like Steven Gerrard, so it's unreal to think I'll be training with these players day in and day out. "I'm really excited and can't wait for the season to start now. I want to get at least 20 games under my belt this season so I can start getting myself into it. "I am confident, you have to be. When you are 18 years of age and you are getting thrown into games at Anfield then you can't have any fear. You have to go and do what you do." Shelvey was Charlton's youngest ever player when he made his debut aged 16 years and 59 days in April 2008 and the England youth international is relishing the challenge of adapting to life at Liverpool. "Obviously it's a different lifestyle compared to being at Charlton," he said. "The training is harder, everyone is a top quality professional, so it's totally different. It's different but I'm enjoying it. It's hard but I'm coping with it and it's good to be here. "It still hasn't really sunk in now that I could be playing in the Premier League week in and week out. It's unreal." Having made his name at Charlton as a goalscoring midfielder, Shelvey is hoping to be in the thick of things at his new club. "I'm an all-action player," Shelvey said. "I can defend, although I'd rather be bombing on to score goals and create things. "I used to play in the hole behind the striker at Charlton but I prefer to play in central midfield to dictate the play. "From watching the Premier League on the television you seem to get a lot more time and space on the ball compared to League One and that will suit me. "I just can't wait to show the fans what I can do." Liverpool manager Roy Hodgson has warned potential suitors Chelsea, Manchester City and Barcelona that striker Fernando Torres is not for sale. The 26-year-old Spain international has been the subject of persistent speculation linking him with a big-money move away from Anfield this summer. The trio have all been mentioned as potential destinations but new boss Hodgson, having met Torres this week, has emphasised his determination to keep him. Hodgson took charge at Liverpool a fortnight ago but was unable to meet Torres at first due to the player's involvement in the World Cup in South Africa. Speaking at his team's pre-season training camp, Hodgson said: "I have met with Fernando. "I found him to be a very pleasant man and we had a nice conversation. "As far as we are concerned he is a Liverpool player and we want him to remain a Liverpool player. "He is not for sale and we don't welcome any offers for him. We want to keep him. "My conversation with him was only short because I had to leave to come to the training camp in Switzerland. "We spoke about football, the World Cup, his injury, and I told him how much I am looking forward to working with him. "Christian Purslow [managing director] was also at the meeting and chatted to Fernando for a lot longer after I left but my chat with him was only about football matters." Liverpool officials flew to Spain to meet Torres this week to assess the injury he sustained in the World Cup final last weekend. Torres suffered a slight tear in an adductor muscle in the closing stages of Spain's glorious defeat of Holland in Johannesburg and will be out of action for another three weeks. That rules him out of much of Hodgson's pre-season plans, and a two-legged Europa League qualifier, but he had been granted a three-week break due to the World Cup anyway. Liverpool are still hopeful Torres will be fit for their Premier League opener against Arsenal on August 15. Hodgson was equally forthright on the subject of captain Steven Gerrard's future but the picture concerning Argentina skipper Javier Mascherano is unclear. The pair, who have not begun pre-season training yet either, have also been linked with moves elsewhere. Gerrard is rumoured to be a target of Real Madrid while Mascherano's agent has claimed Inter Milan are interested in his client. Hodgson said: "I have met with Steven and thought the talks were positive. "We are in a situation where we hear our players are being courted by other teams but it is all just rumours. "What we haven't had is a club wanting to buy Steven Gerrard. Steven Gerrard is not for sale - I made that clear to him. "I told him I supported the club's policy that we don't want to sell our best players and have to start building again." He added: "I have tried to contact Javier. I have left him voice messages and sent him texts but had no reply. "To be fair to him, that's not unusual because he's had a tough World Cup and I believe he's gone back to Argentina. "It's not always easy to get in touch with people. I have tried to reach him to make clear I am happy to talk with him at his convenience."